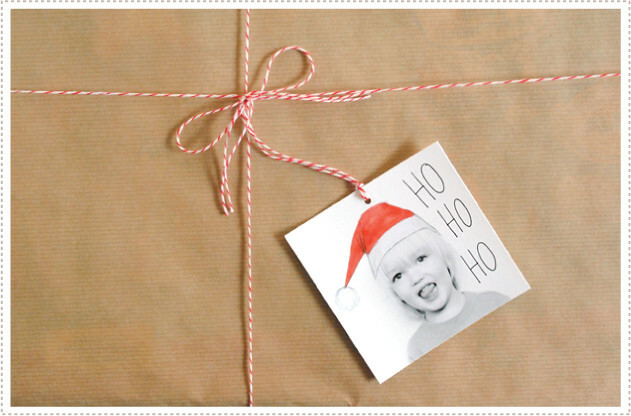 I thought it would be fun to personalize our gift tags this year. I knew the boys would be thrilled to run to their presents to see their own faces on the packages. I was just going to go with good old fashioned photos when I thought, "hey, why not spice things up a bit?". 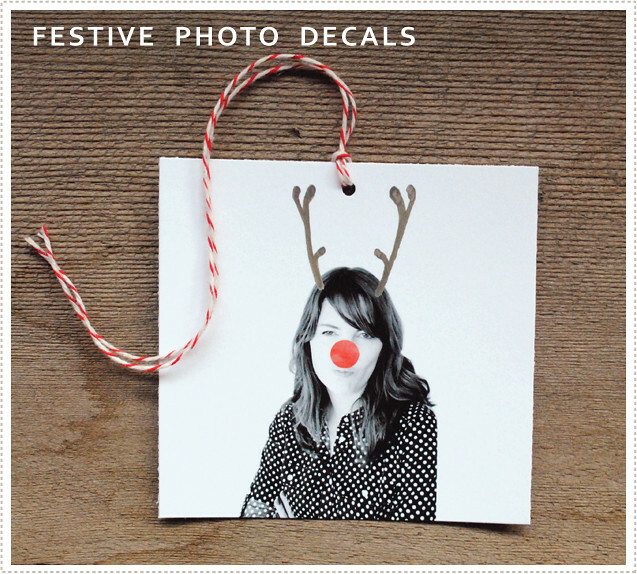 So I created some digital photo decals to make things especially festive. The boys managed to get a sneak peek at these tags and they love them. They couldn't contain their giggles when they saw, not only themselves but mom and dad as silly reindeer. And to spread some Christmas cheer I'm gifting you with the download for the decals so that you can spruce up your own set of personalized gift tags! Just click HERE. To use these just open up Photoshop and you will see everything in a layered file. 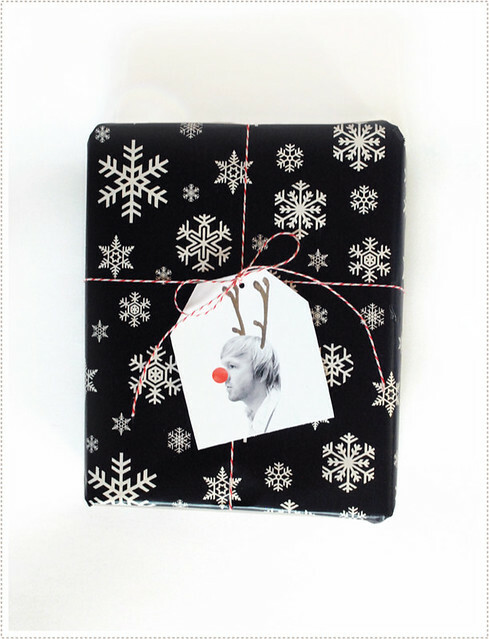 I would recommend turning your photos black and white first (click convert to grayscale in photoshop) and then turning them back into CMYK files before dragging the hat and reindeer decals onto the photo. Then print out your tags and feel free to add a personal saying or just a good old "love, mom and dad". 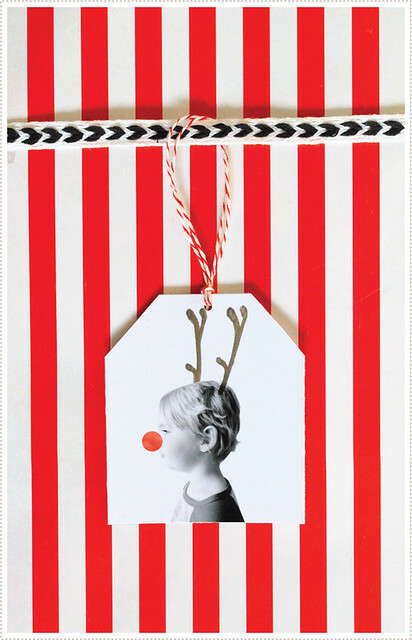 Then sit back and watch your littles race to their personalize gifts on Christmas morning! Such a unique idea! Photos instead of just writing the name. Love. Love this, so fun! And funny! if only i had photoshop!!! Love Love Love these. What a wonderful idea. Your blog is one of my very favorites.... Your boys are so lucky to be constantly surrounded by your creativity. Thanks for sharing. cute! sometimes i color copy old family photos (i.e. baby photos) and then use a punch to turn it into a tag. wish i had photo shop to doll them up with the decals! Can you do these without Photoshop? Is it compatible with a mac? They are just adorable!! Yes it's compatible with a mac but you do need photoshop. I'm looking into figuring out another way to use them with other programs and if I do I'll be sure to let you know. thanks! Love these..but I am havign a hard time downloading them. I signed in but I am getting fake download buttons that take me to other sites? I'm not very good w/ layers, yet. I've convereted my images to B&W, moved the antlers and nose to my photo, but I can't figure out how to resize the shapes. They are much too small for my image. (I'm using CS4). Any suggestions? Thanks for these, by the way. They are awesome sauce. 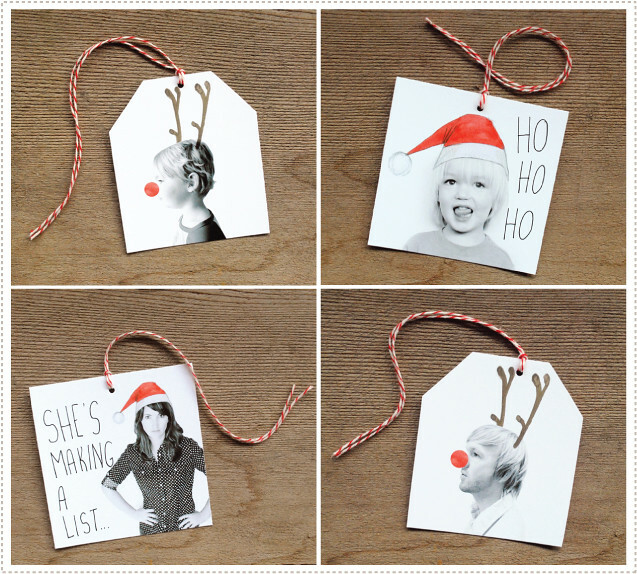 It's taken me a year to get round to it but I've used your download and created some Christmas tags of my own. Thanks for the inspiration and the download.